Chill-out in a Lexus | What Car? Lexus is offering a new in-car entertainment package for its RX model range. The ICE system consists of two eight-inch screens mounted on the back of the front seats, with a DVD player, USB port and SD Card readers. Gamers can get their kicks on the move too, as each unit has an RCA input, so compatible games consoles can be hooked up to the system. 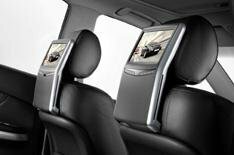 The screens can be operated independently of each other, so passengers wont havce to argue over what to watch. Plus, no-one else will have to listen in on the action, as two pairs of infra-red headphones are also included. The ICE package is standard on both SE-L trims of the RX 350 and RX 400h, and as a 2200 option on the rest of the range.